The rules of this great skill game are quite easy but the gameplay itself is a bit tricky until you figure it out. Your job is to make your ninja pig grow bigger and bigger and when he contacts other items both of them will shrink a bit in size. The way you will increase your pigs size is by holding your cursor on top of them. He will spin his weapons and inflate, but you must not hold the cursor above your pigs at the moment of contact or they will turn into the other creature they have touched. Try to grow them while they are safe of contact and when the units do collide later on, yours will be stronger if it is bigger. A game is won when only piglets and neutral units are left in play. 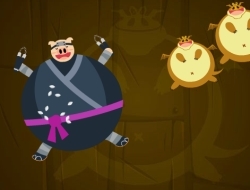 Ninja Pig 0.00 between 0 and 10 based on 0 votes.